Snap is a new packaging format introduced by Ubuntu as an successor to dpkg aka debian package. It offers sandboxing and transactional updates and thus is a competitor to the flatpak format and resembles docker images. As with every new technology the weakest point of working with snaps is the documentation. Your best bet so far is the snappy-playpen repository. There are also some rough edges regarding desktop integration and python interoperability, so this is what the post will be about. I will introduce some quircks that were needed to get teatime running, which is written in Python3 and uses Unity and GTK3 via GObject introspection. The most important thing to be aware of is that snaps are similar to containers in that each snap has its own rootfs and only restricted access outside of it. This is basically what the sandboxing is about. It must know which theme the user currently uses, and after that it also needs to access the theme files. However we must also tell our app to look for the according libraries inside its snap instead of the system paths. For this one must change quite a few environment variables manually. Fortunately Ubuntu provides wrapper scripts that take care of this for us. They are called desktop-launchers. The desktop-launch script takes care of telling PyGTK where the GI repository files are. You can see the full snapcraft.yml here. After this teatime will start, but the paths still have to be fixed. Inside a snap “/” still refers to the system root, so all absolute paths must be prefixed with $SNAP. Actually I think the design of flatpak is more elegant in this regard where “/” points to the local rootfs and one does not have to change absolute paths. To bring in the system parts flatpak uses bind mounts. the snap package results in 120MB compared to a 12KB deb. This is actually a feature as shipping all the dependencies makes the snap installable on every linux distribution. However I hope that we can get this down by introducing shared frameworks (like GTK3, Python) that do not have to be included in the app package. [Update: fixed] Due to another issue, your snap has only the C locale available and thus will not be localized. [Update: fixed] Unity desktop notifications do not work. You will get a DBus exception at the corresponding call. [Update: fixed] The shipped .desktop file is not hooked up with the system, so you can only launch the app via the command line. in this post I want to introduce the OGRE fork on github. The goal of the fork is to provide a stable and reliable OGRE 1.x series while at the same time modernizing parts under the hood updates. The idea behind this is that there are many existing 1.x codebases, actually a whole 1.x ecosystem, that can be modernized that way. The last release of the 1.x series was over 2 years ago, so using the current 1.10 branch already gives a lot of improvements. one of the best resources to learn modern OpenGL and the one which helped me quite a lot is the Book at www.arcsynthesis.org/gltut/ – or lets better say was. Unfortunately the domain expired so the content is no longer reachable. Luckily the Book was designed as an open source project and the code to generate the website is still available at Bitbucket. Unfortunately this repository does not seem to be actively maintained any more. However I did not simply mirror the pages, but also improved it at several places. So what has changed so far? UEFI is the successor to BIOS for communicating with the Firmware on your Mainboard. While the first BIOS was released with the IBM-PC in 1981, the first UEFI version (EFI 2.0) was released 25 years later in 2006 building upon the lessons learned in that timespan. So UEFI is without any doubt the more modern solution. You could reinstall both Windows and Ubuntu to get UEFI. However it is also possible to convert existing installations of both on the fly – without the backup/ restore cycle. You should still do a backup in case something goes wrong though. Only the 64bit Versions of Windows support UEFI. Therefore this guide assumes that you run the 64bit versions of both Windows and Ubuntu. Furthermore verify the following items before you continue – otherwise you will not be able to finish the conversion. Use GParted in case you have not enough space before the first or after the last partition. Typically Windows 8 creates a 350MB System Partition upon installation. This space can be reclaimed for a 100MB EFI partiton and a new 100MB Windows System partition. UEFI bootable Ubuntu USB drive. You can use the startup disk creator on ubuntu with an Ubuntu 14.04+ ISO. UEFI bootable Windows USB drive. You can use the Microsoft Media Creation tool for Windows 10 to get one. to test that the sticks are indeed UEFI compatible, try booting them with CSM Mode disabled in your BIOS. UEFI requires a GUID Partition Table (GPT), so first we need to convert from MBR to GPT. After this step you will not be able to boot your system any more. So make sure you have the Ubuntu USB drive ready. Now boot your Windows USB drive and enter the command prompt as described in this Microsoft Technet article at step 6. Continue with the following steps from the Article. Note that we have skipped steps 1-4 as we used Ubuntu to convert the disk to GPT. We have now created a EFI partition, a new EFI compatible Windows System Partition and we have installed the Windows Bootloader to the EFI partition. Your Windows installation should now start again. At this point you could also perform an upgrade to Windows 10, as the upgrade would erase grub from the EFI partition anyway. Next we are going to install grub to the EFI partition and make it manage the boot. As we can not directly boot our Ubuntu installation, we will instead boot from the Ubuntu USB drive and the switch to the installed Ubuntu. This installs signatures for grub and the kernel which are used to verify the integrity of these at boot. Furthermore we install shim, which is a passthrough bootloader that translates from the Microsoft signatures on you mainboard to the signatures by Canonical used to sign grub and the kernel (see this for details). where sdX is again your system drive (e.g. sda). Now you can enable secure boot in your BIOS and benefit. Note that some BIOS implementations additionaly require you to select the trusted signatures. Look out for an option called “Install Default Secure Boot keys” or similar to select the Microsoft signatures. There has been a Firmware update for the Crucial MX100 to MU02. In case you are running Ubuntu there is an easy way to perform the update without using a CD or USB Stick. read this for details of the file format. Note that this actually much “cleaner” than using windows where you have to download 150MB of the Crucial Store Executive Software which actually is a local webserver written in Java (urgh!). But all it can do is display some SMART monitoring information and automatically perform the above steps on windows. If you want to get your Xbox One/ Xbox 360 running on ubuntu you basically have the choice between the in-kernel xpad driver and the userspace xboxdrv driver. Most of the guides recommend using xboxdrv as xpad has been stagnating. However using xboxdrv has some disadvantages; as it runs as a daemon in userspace you have to manually take care of starting/ stopping it and giving your user access to the virtual devices it creates. Xpad on the other hand just works as any other linux driver directly inside the kernel which is more efficient and hassle free. Unfortunately there are still several issues with the SteamOS driver. This follow-up post discusses them and the solutions in detail. The bottom line is that I updated the official linux driver with chunks found in the SteamOS driver, as well as in several patches floating around the internet. Code and install instructions are available at Github. The build-in opencv line drawing function allows to draw a variety of lines. Unfortunately it does not allow drawing a gradient line interpolating the colors at its start and end. Sensors-Unity is a new lm-sensors GUI for the Unity Desktop. It allows monitoring the output of the sensors CLI utility while integrating with the Unity desktop. This means there is no GPU/ HDD support and no plotting. If you need those you are probably better suited with psensor. However if you just need a overview of the sensor readings and if you appreciate a clean UI you should give it a shot. It is written in Python3 / GTK3 and uses sensors.py. You can contribute code or help translating via launchpad. The idea is that you do not need the sensor information all the time. Instead you launch the app when you do. If you want to passively monitor some value you can minimize the app while selecting the value to display in the launcher icon. To get the data libsensors is used which means that you need to get lm-sensors running before you will see anything. However once the sensors command line utility works you will see the same results in Sensors-Unity as it shares the configuration in /etc/sensors3.conf. Unfortunately configuring lm-sensors via /etc/sensors3.conf is quite poorly documented, so lets quickly recap the usage. In order not to interfere with other utilities and to allow per-user configuration of the labels/ sensors Sensors-Unity first tries to read ~/.config/sensors3.conf before continuing with the lm-sensors config lookup described above. sensors.py is a new python wrapper for libsensors of the lm-sensors project. 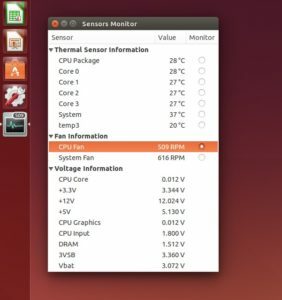 libsensors is what you want to use to programmatically read the sensor values of your PC with Linux instead of parsing the output of the sensors utility. sensors.py is not the first wrapper – there are two alternatives, confusingly both named PySensors. PySensors (ctypes) follows a similar approach to sensors.py by using ctypes. However instead of exposing the C API it tries to be a object-oriented(OO) abstraction, which unfortunately lacks many features and makes the mapping to the underlying API hard. Furthermore it does not support Python3. PySensors (extension module) does not use ctypes and thus is more efficient, but if you write a python script probably compiling a extension module is worse than losing some performance when reading the values. Additionally there is python3 support and also some OO abstraction. The latter is somewhere in between the C API and proper OO: sensors_get_label(chip_name, feature) is ChipName.get_label(feature) instead of feature.get_label(). So what makes sensors.py immediately different is that it does not try to do any OO abstraction but instead gives you access to the raw C API. It only adds minor pythonification: you dont need to mess with pointers, errors are converted to exceptions and strings are correctly converted from/ to utf-8 for you. for a more sophisticated example see the example.py in the repository. If you use your laptop as a desktop replacement, you will at some point get an external display and a mouse/ keyboard for more convenient usage. At this point the laptop becomes only a small case of non-upgradable components. 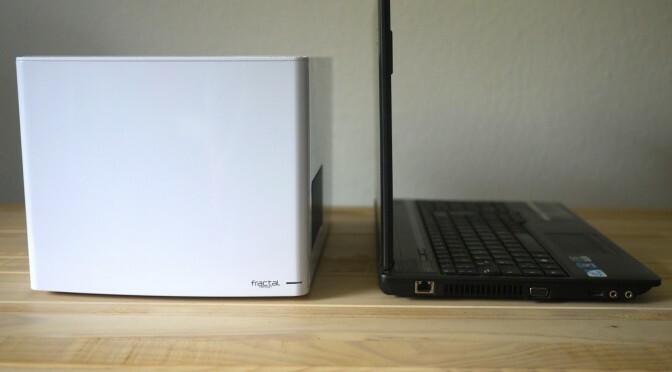 Now you could as well replace your laptop by a real case of comparable size. This will make your PC not only easily upgradable, but allow higher-end components while being more silent at the same time.